A big congratulations to Erin Davis who recently passed her nursing exams to become a Registered Veterinary Nurse. Erin started working at Cundall & Duffy Veterinary surgeons in December 2013. Prior to this she had been studying at Askham Bryan College, Extended Diploma in Animal Management for two years where she gained an overall Distinction. 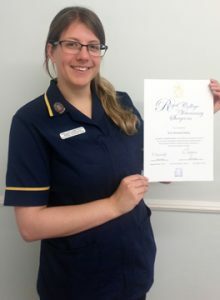 Erin thoroughly enjoyed this course and was thrilled when she was able to gain a job at the practice as a Nursing Axillary as this is what she had always wanted to do with the hope one day she would be a qualified veterinary nurse. In January 2017 Erin started going to college one day per week at The College of Animal Welfare in Leeds in order to study the Level 3 Diploma in Veterinary Nursing, alongside working in practice the other four days. This course was very challenging, however very rewarding as this is all she had wanted to do for a very long time. Over the two years she worked extremely hard and had to discipline herself to study, complete assignments, revise for exams, work on NPL in practice, work in a busy mixed practice and try to have a little bit of a social life. In January 2019 all this hard work over the past two years paid off and she finally gained her RVN (Registered Veterinary Nurse) status. Erin was overjoyed as she knew the all the blood, sweat and tears was worth it. Now she is qualified in practice and looks forward to the new challenges and responsibilities ahead.